I recently made a maple carving board. MO finishing sounded very straight forward. I pooled on some mineral oil and spread it around to coat the surface, giving extra attention to the end grain. After a day or so I’d come back, the oil would be completely absorbed, and I’d repeat. I did this about 10 times, over a couple weeks, until a eventually a thin coat would no longer be absorbed in a couple days. It seemed to be saturated, so I figured I was done. I wiped it clean and it looked and felt great. Before putting it into service, I gave it a quick rinse in the sink to remove any leftover dust. To my horror, it sucked up the water like a sponge. My beautiful hand-scraped surfaces now look and feel like they were just rough sawn. I felt like I’d put a ton of oil into the board, and was sure the water was going to bead right off it, but man was I wrong. Any advice for what I do now? My first thought it to dry, soak in MO for a week, and then re-sand/scrape. But it looks in other MO topics like it’s easy to overdo mineral oil and wind up with a board that oozes for months, so I’m not sure. Thanks for any help! Well, seems like you saturated the board with MO, and it will never dry, MO is to be applied thinly, it is more a visual enhancement than protection for a board and will do nothing to stop the grain from raising as you noticed. MO only finished products should be lightly sanded and re coated regularly in order to maintain the original look. So now you need to get as much MO out from your board, wrap it up in newsprint, paper towels, or any absorbent paper, leave it for about a week and remember to change the wrapping often. After that allow it to air dry for about three days, sand it back with MO and sandpaper. You can also mix beeswax along with your MO for sanding, this gives you a better surface finish and is slightly more durable. Oh, okay. I guess I completely mistook the purpose of mineral oil finishing. I was expecting it could be used to make the board repel water like my steak knife scales and bamboo cutting board do. That’s disappointing, but glad I know better know. Thanks for the info! I think the water raised the grain ….. I would just give it a very very light sanding, wipe on a bit of mineral oil, and start using the board. 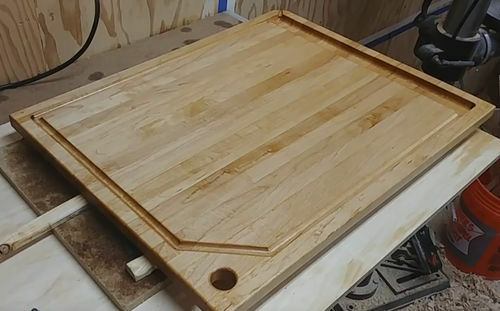 Its a cutting board, your looking for a food safe finish not perfection. I was concerned about this with the first board I made. Not having done it before, I thought (on a whim) that maybe spritzing it with water after initial sanding, sanding that raised grain back down, then applying the mineral oil would keep subsequent washes from raising the grain much. I checked it out a week or two back (been in service for months), and the surface is still about as smooth as when I finished it…except for the knife marks! So now you need to get as much MO out from your board, wrap it up in newsprint, paper towels, or any absorbent paper, leave it for about a week and remember to change the wrapping often. i found, if possible, putting something like this in a box of sawdust works good, too. might be wise to not rinse the board in the sink any more. i think there supposed to be wiped down.